If you are planning a trip to Paris, consider making a side excursion to Lyon. Adding a couple of nights to your travel itinerary is well worth the effort in order to experience this unique French city. 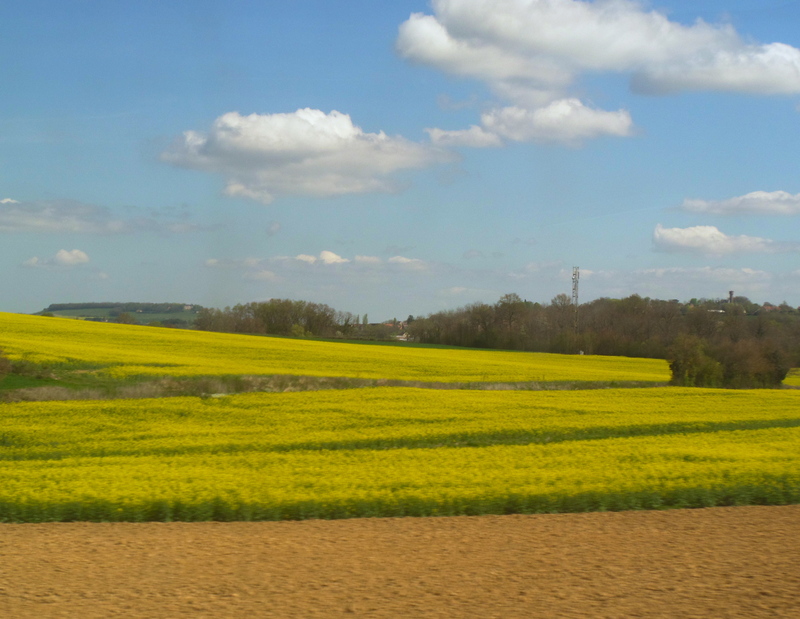 Reserve a seat on the TGV, France’s high speed train, and you’ll zip through picturesque country villages and fields of bright yellow canola, making the 465 km trip in two hours. Lyon is located southwest of Paris and is part of the Rhone-Alpes region. 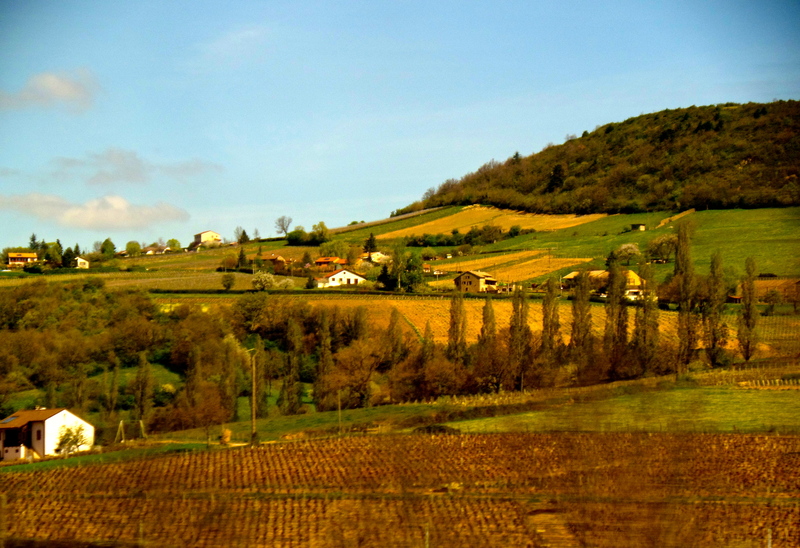 The heart of Lyon, Presqu’ile, which literally means “almost an island,” is nestled between the Rhone and Saone Rivers. 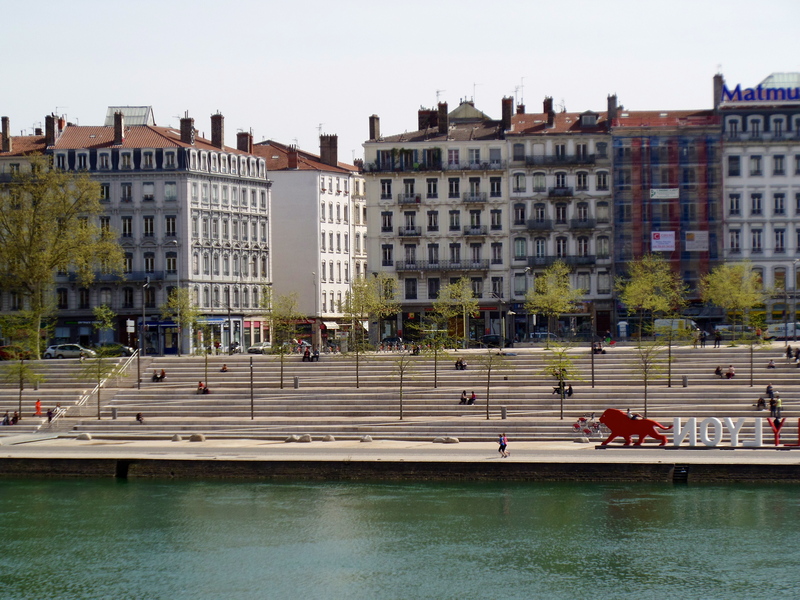 Lyon is a vibrant city–an important banking center for France, the headquarters for INTERPOL, and a hub for the pharmaceutical, chemical and technology industries. 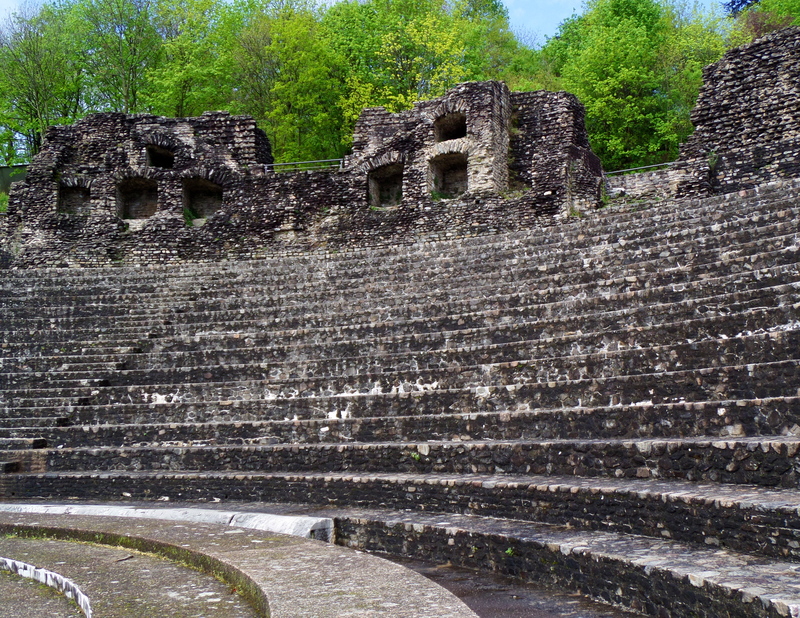 An official UNESCO heritage site, Lyon’s ancient Roman ruins and Old Town are two of many historic areas to explore. 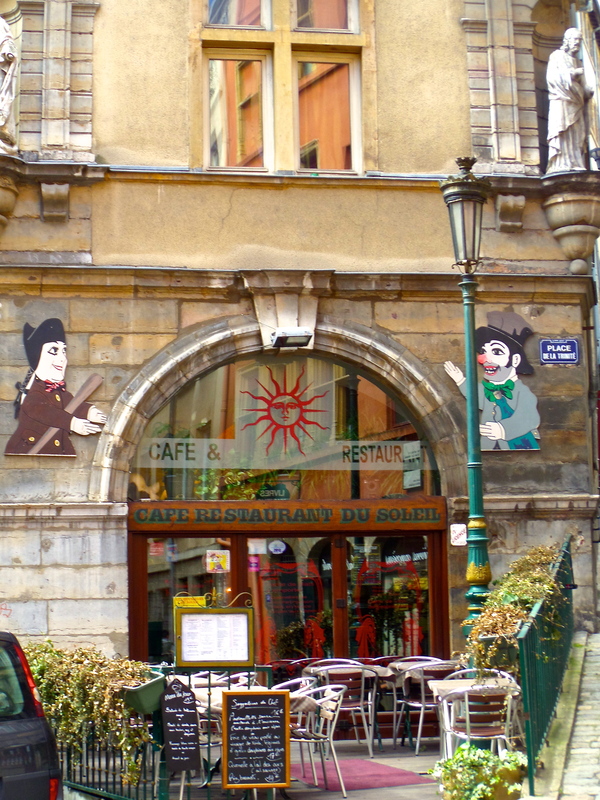 Just as important to me, though, is the city’s unofficial title–gastronomy capital of France! Excellent restaurants abound. Internationally renowned, Lyon-based chef Paul Bocuse, famous as one of the innovators of French nouvelle cuisine, has a string of restaurants from which to choose, including his Michelin 3-star l’Auberge du Pont de Collonges, along with a collection of brasseries, each inspired by a different region of France and named for a different cardinal direction. Our first night in town we ate at Le Sud, his Mediterranean-inspired brasserie, located near the banks of the Rhone. Our wine: Guyot Crozes-Hermitage, Le Millepertuis, a signature selection offered in all of the Bocuse brasseries in Lyon. This 100% Syrah comes from the steep western-facing granite slopes of Crozes-Hermitage in the northern Rhone. So what is a brasserie, really? Its literal translation is “brewery,” but the term is also used to describe a restaurant with a set, printed menu of dishes that are served all day, every day. In a brasserie, you will find a professional waitstaff and white table linens, though the atmosphere is usually relaxed. In contrast, a Parisian bistro, is recognizable by its handwritten, ever-changing chalkboard menu and its offering of French comfort foods in a basic, unadorned setting. 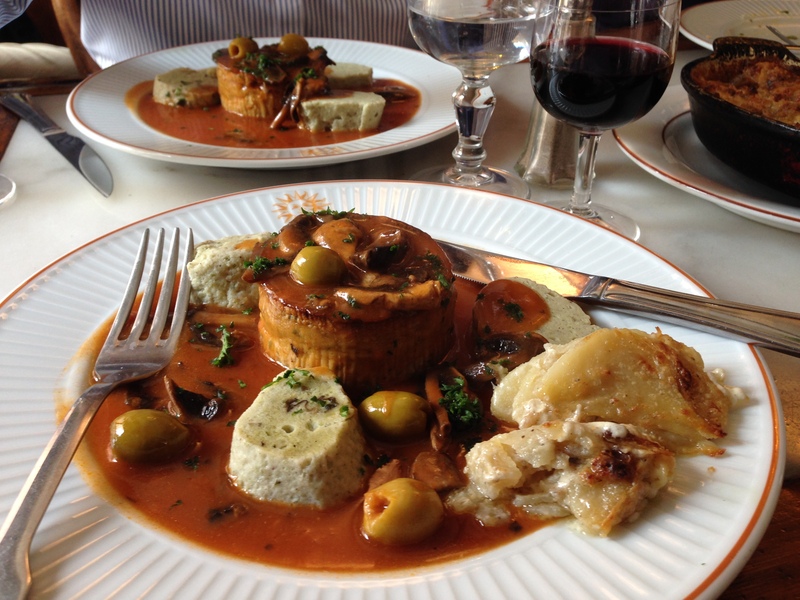 And then there is the bouchon–a traditional, informal Lyonnaise eatery that serves the city’s classic dishes. The bouchon is a big deal in a city that prides itself on exceptional cuisine. 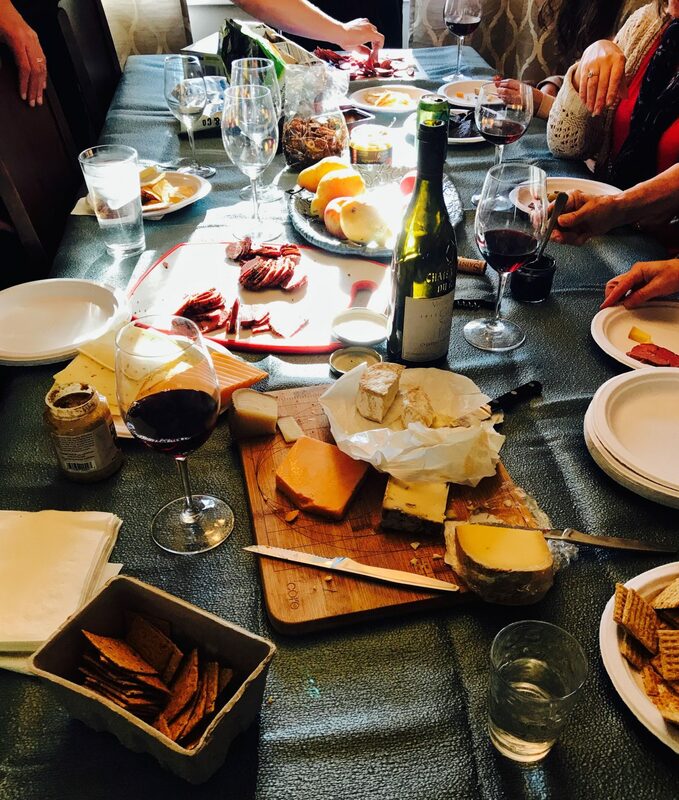 There is even an organization which has created its own certification process to ensure that you are eating in a true bouchon Lyonnais. Touted as the oldest and one of the best in the city is Cafe Comptoir Abel. Our group was able to reserve a table just a few hours in advance. We trekked through the winding streets near the Saone, which were damp and solitary as evening set in and workday traffic dissipated. The warm echo of lively conversation greeted us before the restaurant even came into view. 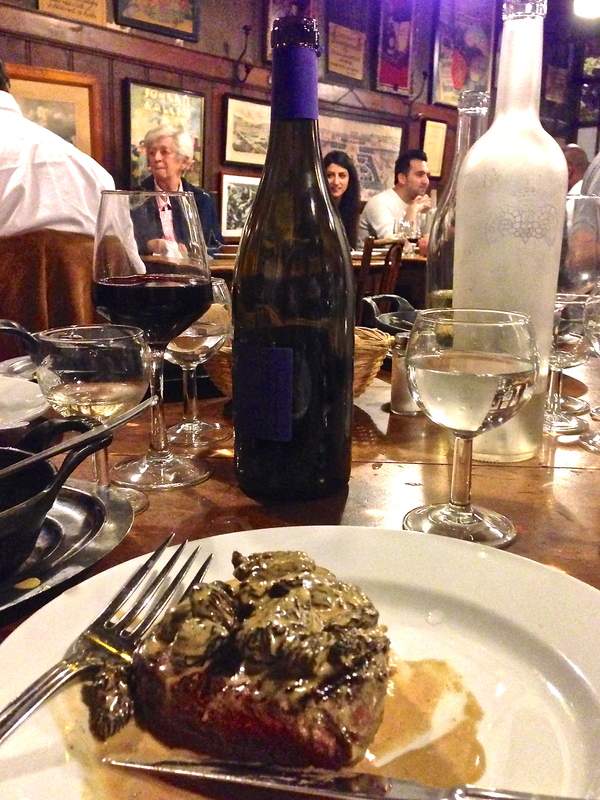 As is supposed to be the case in a true bouchon, there were many family style tables and lots of bustling activity. We each started off with a traditional salade Lyonnaise–a simple, rustic combination of frisee lettuce and chopped bacon, topped with poached eggs and mustard-based dressing. Cutting into the runny eggs creates a delicious coating for the salad greens. I ordered one of the house specialities, le filet de bœuf aux morilles à le crème, taking care to request that my steak be prepared saignant, which literally translates to “bleeding,” and in France will get you a piece of beef cooked rare with a warm, red center. This, as opposed to bleu froid (cool red center) or the nearly raw bleu, which according to David Liebovitz is the way many of the French enjoy their steaks. Known as Lugdunum in Roman times, Lyon was a strategically and culturally significant city within the Roman empire for over three centuries. Our group rode the funicular up to the hilltop Fourviere District where we spent the early morning exploring the ruins of the city’s ancient Roman amphitheater. On our way back down, we stopped in the oldest part of the city, Vieux Lyon, and strolled the cobblestone streets, browsing the many shops along with busloads of German and French high school tour groups. As noon approached, we began to consider our options for lunch. Vieux Lyon is a very touristy area, which does not always bode well for finding a good place to eat. A rule of thumb for me is to steer clear of places that attempt to get you into their dining room by posting an employee in the middle of the street to cajole and shout like a sideshow barker. The Vieux Lyon has its fair share of these, all of them touting what they say is authentic bouchon cuisine, and I’m sure that their food is just fine. But as always with our group, we were hoping to find the “real deal,” so after looking at a few more posted menus, we settled on a place we had noticed at the beginning of our walk in a quieter area near the top of the hill–Le Cafe du Soleil. It all added up to my favorite meal in Lyon and my last great meal in France. As I headed back to Paris that afternoon on the TGV, anticipating the very unexciting dinner options at my Charles DeGaulle Airport hotel, I was already formulating my plans for another food excursion to Lyon.